In September 2006, I set up a experimental two-hole mansion trail with 5 boxes made and donated by Linda Violett of California (see photo, courtesy of Linda Violett). The boxes are hanging from trees on a small town green surrounded by farms and residences. There were 7 existing HOSP-infested, pole-mounted boxes there (see photos) that I stumbled across and obtained permission to manage. Bluebirds have been seen in the area. Note: Two of the boxes went missing - one in 2006, one in 2009 - from climbable trees. 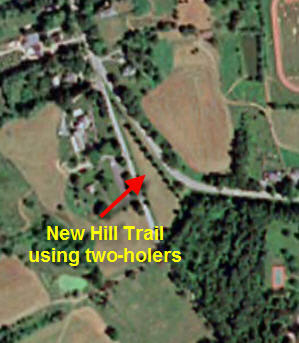 I have another two-holed mansion that is pole-mounted on the Chimalis trail. It has not been used yet. The Experiment: The existing pole mounted boxes (no baffles) were plugged in 2007. In Year 2, someone unplugged the single-holed boxes. No HOSP trapping was conducted, in order to evaluate whether EABLs are able to secure and successfully defend the two-hole mansions despite HOSP competition. I am removing any HOSP nests and eggs on at least a weekly basis. I'm doing this experiment for two reasons: 1) I believe that about half of serious bluebirders prefer passive alternatives to HOSP control or are unwilling to take any steps to keep HOSp out of boxes, and 2) I want to gather data about two-hole box usage by EABLs. I can't wait to see what happens, although I admit it will be hard to potentially allow some losses to HOSP. I also want to limit the variables so I can assess the two-holers. (I do use ground and inbox traps as needed on my other trails). Squirrels may be an issue with the hanging boxes, as red, grey and flying squirrels are common in this area. Here are my opinions, based on two full seasons (2007 and 2008) and one partial season (2008). However, be aware that I only have four of these hanging two holed boxes. I also have 80+ pole mounted boxes. Increased species diversity (which is something I WANT). In 2008, one of the only TUTI nesting was in a two-holed mansions, along with one of only two WBNU nestings (one in a 2 holer, one in a tree-mounted one holer - both were successful. In 2007, I had only three TUTI's attempts on my trail, of which two were in the hanging boxes (unfortunately both failed due to HOSP and HOWR competition.) The 2008 TUTI attempt in the two-holer failed due to House Wren predation. Safer from vandalism or stealing, ONLY if camoflaged (if hung high enough in a tree that is not readily climbed. Cheaper system (no pole mountings system or predator guards) - a big advantage for a large trail. 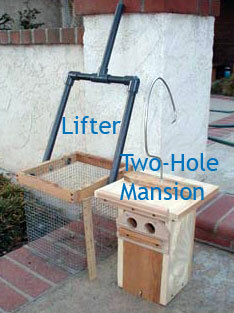 The two-hole mansion is very roomy inside. The two hole mansion probably enables adults to escape more readily from a HOSP inbox attack. HOSP interest seemed to decline after trees leafed out. Harder to monitor than a pole-mounted box, and takes longer (must have lifter or ladder on hand, takes about 2-3 times longer to monitor, tricky to get the technique down, concern about dropping box and disturbing contents and incubating female.) The two-hole mansion per Linda's specs is very heavy. Harder to vandalize (as long as they are hung high enough in a tree that is difficult to climb) BUT the only two boxes ever lost on my trail were these. Both are apparently too close to a posh high school. The first one was too low in a climbable apple tree. The second was in a larger, but climbable tree. Appeal to Flying Squirrels, which may predate nestbox contents. (Personally, I think it is cool to have Flying Squirrels nesting in a box though.) I have never had Flyers in my pole mounted boxes, but in year one had them in 2 out of 4 hanging boxes (however, Linda's boxes are larger than a typical single-holed box.) I have seen Flying Squirrels using pole-mounted boxes in a nearby unmonitored trail on a golf course, where boxes are at forest edge. Low utilization by bluebirds SO FAR. No bluebird attempt until trees had leafed out and HOSP pressure declined in year 1. No bluebird attempts at all in year 2. Some people don't have good "hanging" trees in suitable habitat. The two-hole mansion has a large interior, and users tend to build larger, bulkier nests which takes more time and energy. Do bluebirds, HOSP, HOWR or TRES PREFER hanging or pole-mounted boxes if given a choice? So far it seems like TUTI's prefer the hanging boxes, and possibly nuthatches. Will I be able to duplicate Linda Violett's success raising bluebirds in HOSP infested areas with few losses? 1 NABS HOSP - blue feathers None. 2 SLOT HOSP - saw male perching Pine needles - EABL? 3 NABS HOSP Chewed hole. Cracked. 4 NABS HOSP? TRES? grass and lots of white poop - HOSP? Top is split. 5 NABS HOSP Mouse nest? Grass and leaves without cup. 8/10/06: cleaned out contents of all boxes. Some split roofs. Looks like boxes had not been emptied in years. See photos. No sign of paper wasps. 9/06: Installed 5 new two-holed mansions in trees. Saw at least one male EABL. See 2007 log of activity.